Sixteen year-old Alex Riley's top priorities in life are to find his long-absent father and a girl with a decent set of breasts. But his mother has a knack for sabotaging his plans. To advance her political career, she takes in an elderly black man named Lester Bray. Lester arrives with a vintage Cadillac and an old man's personality. It takes only a week for Alex's mother to ask him to leave. That makes Alex angry. On the morning of his eviction, Lester and Alex set out on a road trip, ostensibly to find the boy's father in Fort Lauderdale. But the two don't just head south. They also cross through un-navigated political, racial, and personal territory. A wild ride, Cadillac Chronicles explores what it takes to find a real friend. "Hartman, author of the memoir Hammerhead 84, makes his YA debut with a hard-hitting road trip novel that's unafraid to show the ugly sides of American life...though the self-knowledge and maturity Alex gains during his travels leave room for hope." "Angry, just-turned-16-year-old Alex, a white boy, and equally angry but very old Lester, a black man, are unlikely road-trip buddies in this novel that transcends its conventions...Alex learns to drive, comes to understand a little of the hard truth of race in post-Civil Rights-era America and spectacularly loses his virginity in a scene that will surprise readers as much as Alex...If there's little doubt about the end of the trip, readers will be happy they've gone along for the ride." 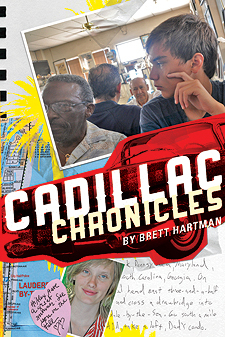 "Lester and Alex from Cadillac Chronicles are going to live in my literary memory for a long, long time. I think they are two of most likable folks to come along in young adult books for a while." "This road-trip novel is full of humor and surprises that make it a delightful read for teenage boys and many girls as well."